We saw this shirt in a Daiso Japan store two or three weeks ago, really can't remember, but they didn't have it in the right size. When we went to the one that had the "lame" eyeshadow, they had it in the right size so Kevin got it for me. I unfortunately forgot to post it or didn't think it was appropriate with a post laughing at the text of an unfortunately named eyeshadow trio. 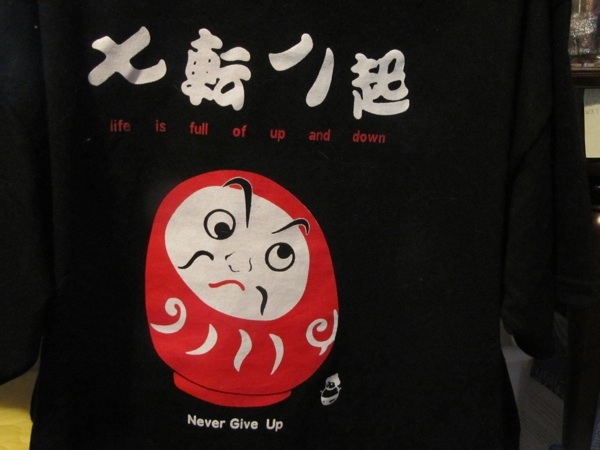 Anyway, in case the text is too small, the shirt reads: at the top "life is full of up and down" and then at the bottom it says, "never give up" with the slightly angry looking Daruma Doll in the middle. The Daruma Doll is supposed to be a good luck charm and if you read the wiki page portion about the shape it is very symbolic about over coming adversity/misfortune so we are hoping it will help with my health issues (we have several of the actual dolls in the house now as well).